Hello everyone, another week another challenge. After doing a 14 mile walk on Sunday of the Yorkshire Wolds it was nice to settle down over thesee last few days and do some crafting. Looking at the Little Claire challenge I saw the theme was animals and put my thinking cap on in order to get my entries together. I needed cards for some birthdays and also a new arrival and I finally came up with the cards below. 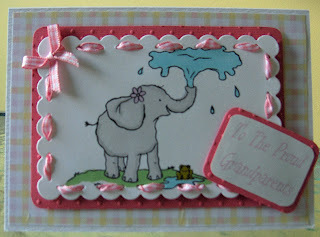 For this I used the Little Claire" Lots of Fun" elephant stamp which I stamped onto a Nellies Die and coloured with pro markers. I then matted it onto card embossed with a clutterbug folder design, which just seems to come in handy so many times. This time I used another Nellies Die and stamped using Little Claires Big Hugs stamp again coloured with Pro Markers. Earlier in the week I had received the new Little Claire club stamp "The Right Time" which was of my favourite animal the owl. I have used all the elements I received in the pack and put my own design together. Three fabulous cards - I can see that you are a Little Claire's fan just like us. Thanks for joining us on the latest challenge. 3 fab cards, love all of them. Thank you for joining us at Little Claire.